ANAHEIM, Calif. (AP) — Tommy La Stella homered twice and drove in four runs, and the Los Angeles Angels beat the Milwaukee Brewers 11-8 on Tuesday after Mike Trout departed with a groin injury. Los Angeles extended its win streak to five games. Jonathan Lucroy had two hits and three RBIs against his first major league team. Trout left in the fourth inning after he strained his right groin while sliding into second base in the second. The Angels say their $426.5 million center fielder is day to day. Cam Bedrosian (1-0) pitched a scoreless inning for the win and Cody Allen got three outs for his third save. Yasmani Grandal homered twice and drove in three runs for Milwaukee. Alex Wilson (1-1) got the loss. 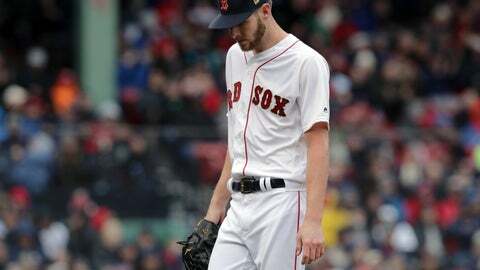 BOSTON (AP) — Chris Sale let a Toronto runner steal home, Mookie Betts fanned with two on for the final out and the Red Sox stumbled again, losing to the Blue Jays in their home opener. After receiving their World Series rings, the Red Sox fell to 3-9. A return to Fenway Park failed to shake the doldrums that plagued Boston during a season-opening trip to Seattle, Oakland and Arizona. Red Sox sparkplug Dustin Pedroia went 1 for 4 in his first major league game since May. He played only three times last year while slowed by a knee injury. It was the first big league matchup of managers born in Puerto Rico, with Toronto’s Charlie Montoyo topping Boston’s Alex Cora. Toronto ended a four-game losing streak. Freddy Galvis drove in two runs to back Matt Shoemaker (3-0), who allowed two earned runs in 5 2/3 innings. Sale (0-3) surrendered five runs and seven hits before being pulled after four innings. PHILADELPHIA (AP) — Juan Soto hit a three-run homer in the 10th inning, and Washington rallied for the win. Philadelphia’s Bryce Harper crushed a three-run homer off former teammate Stephen Strasburg, but Victor Robles tied it at 6 on a solo shot off Edubray Ramos with two outs and two strikes in the ninth. Ramos hadn’t pitched in six days and has one career save but Phillies manager Gabe Kapler brought him in to protect a one-run lead. Brian Dozier and Anthony Rendon hit consecutive singles off Jose Alvarez (0-1) to start the 10th and Soto followed with a towering shot over the right field foul pole. A video review upheld the fair call. Robles added an RBI double in the inning. Sean Doolittle (3-0) got five outs for the win. NEW YORK (AP) — Jacob deGrom’s record-tying streak of quality starts ended at 26 when he allowed two home runs to Mitch Garver and one to Eddie Rosario in a drubbing by the Twins. Minnesota had six homers, including a pair by Jonathan Schoop. The Mets hit four of their own, two by rookie Pete Alonso, as the teams combined for the most home runs in a game at Citi Field, which opened a decade ago. DeGrom (2-1) gave up three homers and was lifted for a pinch hitter in the fourth inning after allowing six runs and eight hits. Kyle Gibson was in position to win but was removed after 4 2/3 innings for the second straight start. He loaded the bases with a pair of two-out walks, and Trevor Hildenberger (2-0) retired Jeff McNeil on a flyout. ST. LOUIS (AP) — Yadier Molina drove in three runs, Paul Goldschmidt homered and the Cardinals beat the Dodgers despite an embarrassing play by Marcell Ozuna. St. Louis already had a 4-0 lead when Kiké Hernández led off the eighth with a drive to left. Ozuna went back and climbed up the wall, but he misjudged the ball and tumbled onto the warning track as he tried to make the play. Hernandez’s drive bounced over for a ground-rule double, but Mike Mayers and Andrew Miller managed to escape the threat. Los Angeles dropped consecutive games for the first time this season. Ross Stripling (0-1) got the loss. HOUSTON (AP) — José Altuve hit his 100th homer and George Springer’s two-run double in the eighth inning helped the Astros to their third straight comeback win. Houston has won five in a row overall to improve to 7-5. The Astros trailed by one when Alex Bregman doubled off Jonathan Holder with two out in the seventh inning and scored on a double by Michael Brantley that tied it at 3. Chad Green (0-2) retired Carlos Correa to end the inning. But the Astros, who rallied to beat Oakland on Sunday and New York in Monday’s series opener, got another clutch hit from Springer in the eighth. Héctor Rondón (1-0) got the win and Roberto Osuna fanned one in a perfect ninth for his fourth save. KANSAS CITY, Mo. (AP) — Dee Gordon got three hits and drove in two runs as high-scoring Seattle extended baseball’s best record. The Mariners improved to 11-2 and have scored at least five runs in 12 of those games. The Royals lost their eighth in a row. Whit Merrifield extended his hitting streak to 30 games, tying a Royals record set by George Brett in 1980. He led off the bottom of the first with an opposite-field triple to stretch a streak that began last Sept. 10 and included the final 20 games of the season. Marco Gonzales (4-0) gave up two earned runs in six-plus innings. Anthony Swarzak pitched the ninth for his second save in two opportunities. Kansas City’s Jakob Junis (1-1) allowed four runs in four innings. DETROIT (AP) — Corey Kluber earned his first win of the season in his third start, powered by four Cleveland home runs. The Indians won their fifth straight game. Detroit had won five in a row. Kluber (1-2) allowed one earned run over six innings. A two-time Cy Young Award winner who went 20-7 last season, he struck out eight. Leonys Martín, Brad Miller, Roberto Perez and Jake Bauers all entered with sub-.200 batting averages before hitting their first homers of the season. Cleveland had hit a total of only four home runs this year before connecting at Comerica Park. Detroit’s Jordan Zimmermann (0-1) gave up five runs and was chased in the fifth inning. DENVER (AP) — Dansby Swanson and Ronald Acuña Jr. homered, leading Max Fried and the Braves to the victory. Fried (2-0) allowed an unearned run and five hits in six innings. Colorado has dropped its first five home games. It has lost nine of 10 overall since winning the first two games of the season. Rockies right-hander German Márquez (1-1) was charged with five runs and seven hits in five innings. SAN FRANCISCO (AP) — Kevin Pillar drove in four runs for San Francisco for the second straight game, and Evan Longoria broke out of a long slump with an RBI single. The Giants set a season high for runs, one night after blowing a five-run lead with ace Madison Bumgarner on the mound. San Francisco left-hander Derek Holland (1-1) struck out nine in seven crisp innings. Hunter Renfroe homered for San Diego, and Manny Machado walked twice. Joey Lucchesi (2-1) was tagged for seven runs in four innings. CINCINNATI (AP) — Matt Kemp started Cincinnati’s spree of three consecutive homers, and the Reds stopped their eight-game losing streak after their manager and an outfielder were suspended. The Reds hit five homers in all as they won for the first time since opening day. The Reds were missing outfielder Yasiel Puig and manager David Bell, suspended for their part in a fracas in Pittsburgh on Sunday. Puig decided to serve his two-game suspension rather than appeal. Bell got a one-game punishment, and bench coach Freddie Benavides took his place for the series opener. Cincinnati’s Luis Castillo (1-1) struck out eight in seven innings. Miami right-hander José Ureña allowed four runs and eight hits in five innings. BALTIMORE (AP) — Jurickson Profar got four hits and drove in a career-high five runs, helping Oakland stop a four-game slide. Slumping Orioles slugger Chris Davis didn’t play, a day after he set the major league record for the longest hitless streak by a position player at 0 for 49. Profar and Marcus Semien homered as the A’s won on the road for the first time in five tries this season. Center fielder Ramón Laureano threw out another runner, and Brett Anderson (3-0) won his third straight start. Trey Mancini singled in the first and has reached safely in all 11 games for the Orioles, who have dropped five of their last six. John Means (1-1) got the loss. PHOENIX (AP) — Jarrod Dyson connected for a two-run homer in the ninth inning, lifting the Diamondbacks to the win. Dyson, batting for John Ryan Murphy with Eduardo Escobar on second base, drove a 2-2 pitch from Jose Leclerc into the seats in right field. Arizona rallied from a 4-0 deficit after two innings for its third win in four games. Matt Andriese (2-0) pitched two innings of scoreless ball in relief of Zack Greinke. Murphy and Nick Ahmed hit solo home runs for the Diamondbacks. Down 4-2 in the ninth, the Diamondbacks’ Christian Walker led off with a single against Leclerc (1-1), who blew a save chance for the first time this season. Escobar doubled in Walker and Ahmed struck out before Dyson went deep. CHICAGO (AP) — Austin Meadows homered and set a career high with four hits, powering Tampa Bay to the win. The Rays pounded Ervin Santana (0-1) and improved to 9-3, their best start in nine years. They also extended a club record by clinching their fourth straight series victory to start a season. Avisaíl García smacked a solo homer in the second and finished with three hits, giving him five in the past two games. The White Sox opted not to offer him a contract in the offseason, parting ways after 5½ years, and he signed with Tampa Bay. Charlie Morton (2-0) went five innings for the win, allowing two runs and three hits. Yoán Moncada hit a two-run homer for the White Sox. Tim Anderson had two hits, including an RBI single in a three-run eighth.